Properties in the vicinity of Spring Gardens Road and Green Road. The area bounded in blue on the map shows the area covered by flood alerts and warnings for Colne Water at Lenches, between Cotton Tree Lane and Railway line south of the river. Commercial premises in Waterside Industrial Estate and Green Road. Properties in Cotton Tree Lane. Properties in Cotton Tree Lane, Lambeth Street, and Hollington Street. 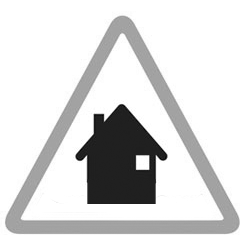 Properties on Holme Street, Winewall Road, and Trawden Road. Industrial and commercial units in Garden Vale Business Park, Riverside Mill, and on Burnley Road.